In anticipation of it becoming baby central, I’ve been working on the basement! 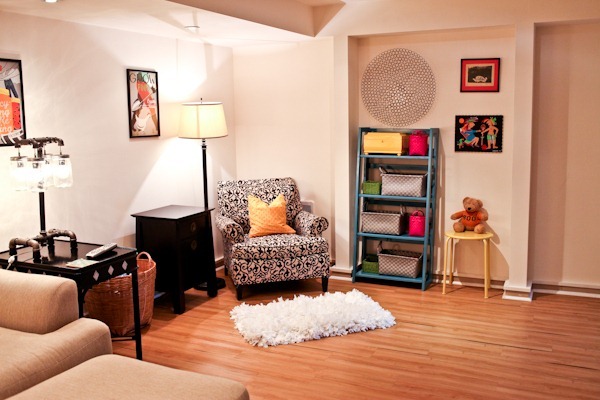 It’s so dark and dreary, I wanted to bring in a bunch of bright colors and functional storage, seating and toys. It used to look like this – an empty corner with a bookcase and a printer. The lamp went to the nursery, the books to our upstairs bookshelves and the printer to our hidden closet shelves. On the left side is TV central. I’m sure I’ll spend a good amount of time on this couch, but it’s also really hard to get into because it’s so big and sunken, so I think the chair is actually going to make a better nursing spot. Moving the arm chair to the corner. I never knew what to do with this corner and kept putting things in it that I didn’t like. I like the chair! It fills up the corner space well. 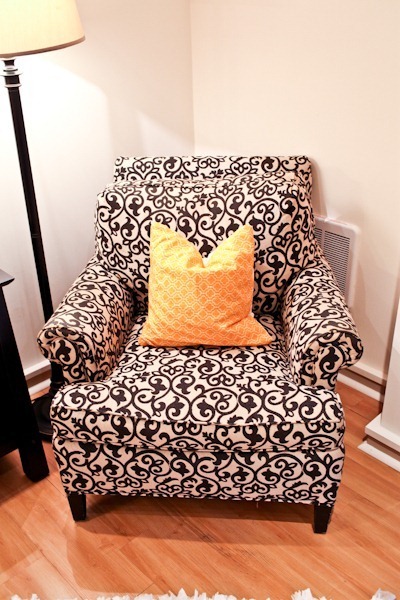 We could have bought a glider for this room, but I just didn’t want to spend the money since we have this great (comfortable + stylish) arm chair. Plus, I hear exercise balls are great for soothing babies – so our friends with a 2 month old tell us! We have one of those down here and ready to go. 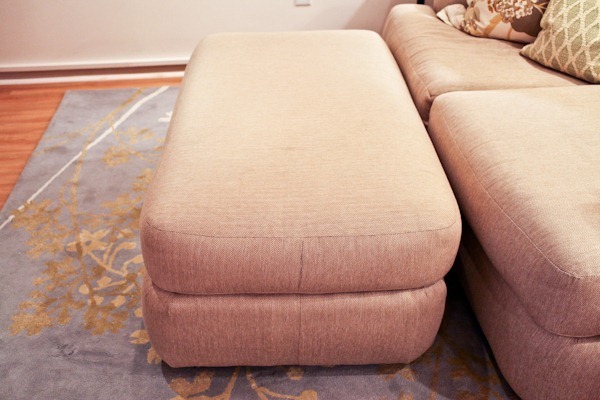 And tucked nearby – a foot stool to prop up feet and recline (also the huge couch if that turns out to be more comfortable). ALSO a rocking chair on the porch I can bring down if needed. OR I can lie sideways on the ottoman. Next to the chair is mom’s station – a spot for water bottles, snacks, computers, phones, books, etc. The drawers are empty and ready to receive items! Underfoot is a new rug I found at Pier 1 for $25 bucks! I wanted a play rug for the baby to lounge on and play with toys and things. I researched all kinds of bigger rugs, round rugs, and expensive rugs and decided that until I need an expensive rug, this inexpensive fluffy guy will be fine – at least until he’s ready to need 10 feet of crawling space. I almost went with red, as white seemed impractical, but then I remembered spit up and breast-fed baby poop is white/beige and I actually think it will blend better in this than a darker color. If I have to toss it after 6 months I will – another reason to go cheap. 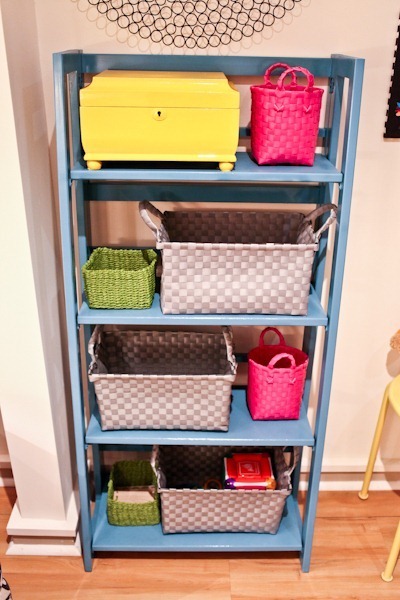 I love the bright colors, and they are ready to store diapers, wipes, toys, and more. Look, one already has some toys from Baby Raffi! There is also lots of floor space for the swing, bouncy seats, pack n plays and more. I think the majority of our baby stuff will end up down here – which means the upstairs will hopefully be a neat retreat. Great set up! I have a recommendation for one of your baskets: Breastfeeding Supplies. I kept one basket at both places where I did most of my nursing and it had the following: breast pads (I liked Lansinoh disposable), burp cloth (dish towels work fine), wipes, bottle(s) of water (breastfeeding is thirsty work! 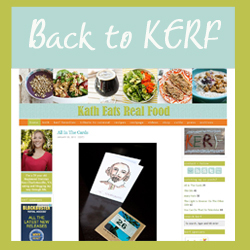 ), snacks like granola bars, fruits, etc. stuff you can eat with one hand, the remote (crucial!) and your book or e-reader. Once you sit down to nurse you might be there for 45 min or longer so it pays to be prepared for a long sit. Since you already plan to have a diapering station down there, let me recommend adding at least one change of clothes for you both. You may find while you are two floors away from your dresser that you are covered in spit up and not keen to go through your whole house to get some new clothes. It is great to be able to re-dress both of you on the spot. Do you have a monitor for this room? i envision baby nodding off on his rug or in a swing or something and a monitor would let you leave him sleeping in situ while you go take care of your own needs in some other place around the house. So excited for you! You are VERY well-prepared. Good idea about the monitor! I made a basket with stuff for diaper changes for the main floor, 2 baskets with after birth care for our 2 bathrooms (so I can go to either one) and a basket full of bathtime stuff since we will be bathing him in the babytub probably on the kitchen counter. Less going up and down! My nesting has really kicked in so I’m thinking of anything and everything at this point 🙂 haha I love nesting! Oh my gosh I absolutely looooove the space!!! So bright, well-organized, but fun as well. Great job, Kath! The basement looks great!!! You’re making me want an exercise ball. I never thought of that before. Comforting for baby and good for moms core!!! One more thing, you are such a gorgeous pregnant lady! In all of your pictures you are always so happy. So nice to see!! 🙂 Thanks for the rec! I’m not with child (but will soon be trying) and you have inspired me to start getting my house in order! I’ve been purging weekly and we are finishing off our enclosed sun porch, to make it more of a 3 season room (new windows, insulation and doors) and adding storage. I’m envisioning that as a great play place when the time comes! haha the breast fed poop isn’t THAT white. 😉 Hopefully you won’t have to test it out. Good to go on the spit up though. In fact, it was bright yellow/orange in our experience. Milk and spitup are far more likely to hit the rug on a regular basis, though. LOL I was thinking the same thing. It’s often YELLOW! But I do love the rug Kath! Yeah, breastfed baby poop is actually REALLY yellow, not anywhere close to white. It looks so wonderful! I am UBER jealous of all the space you have in your home! I still have no idea where to fit a swing. I think we’ll be crawling over the stuff like mad but it will be so worth it! 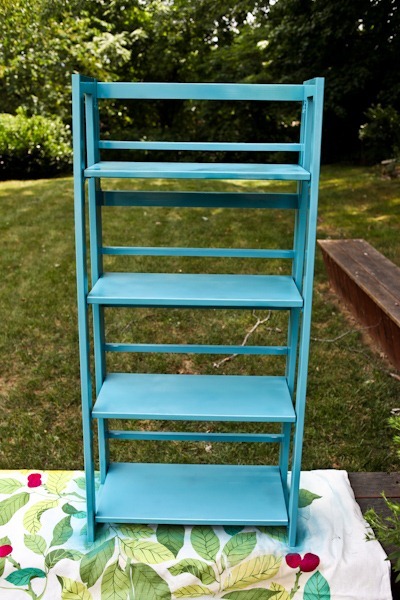 …..LOVE the paint job on the shelf- what a fun color! You are rockin’ at this nesting business, Kath! So cute!! 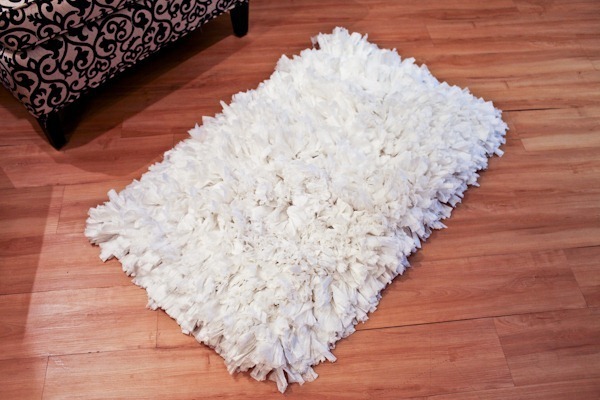 We also have a “fluffy” rug and once baby learned to roll over, he would get the long fibers in his mouth. 🙁 So, you’ll definitely want to lay something over it once he’s more mobile or doing tummy time. And ditto Alison – breast milk poop is orange! But the good thing is – it washes out well and the sun bleaches poop stains in no time, so that’s a plus for whites! It looks like you’ve put a lot of thought into setting things up comfortably.. which is excellent. I would just say maybe make sure you’ve got some “diaper caddy” type things ready to move around the house in case you find you don’t want to sit in the basement. I know that if I were spending my days in a dark basement it might be a recipe for feeling pretty blue, post-partum. For both of my kids, the cuddling up on the couch period only lasted the first week or two (well, with my second it was cuddling up in the NICU, but same idea) and then I wanted to get up and get going so having space everywhere in the house to be able to move around with baby was important! Mustard = light in color. Not dark brown. The basement looks great! I love the bright colors and how you’re organized everything. I think it will be the perfect place to nurse and for the baby to play. 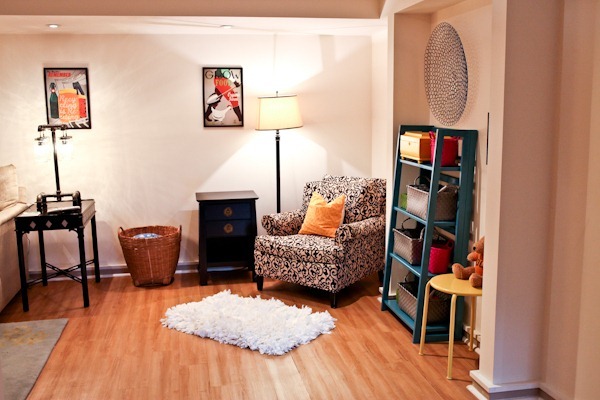 I’m jealous that you have a space you can use as a playroom/baby room… we only have one main living room in our house and it definitely gets cluttered at times with baby stuff! As for the color of breastfed baby poop… at least in our house the color is definitely not white/beige! Much more like a bright mustard color! So, I’m sure that the rug will be great for the baby to play on but I wouldn’t count on the poop blending in. Spit-up, on the other hand, will blend right in! And for us, most of the messes c0me from spit up anyway. Bright mustard is still in the white family – it’s not black/brown/purple/navy blue! My doctor said he could write a book about the many, many colours that baby poop can be at any given time. Whether it be dijon, stone-ground or American, mustard is definitely in the yellow and/or brown category… NOT white. My sons poop was never white or beige when I was nursing! That rug does look fluffy and comfortable. Baby will love to rub all of the fabric pieces. Ha! My EBF baby has never had white/beige poop! The space looks great! I love the look of those colorful baskets. Hi Kath- I have one recommendation. I would steer away from changing diapers on the ottoman all day long. I promise you it will really hurt your back. I had my pack and play close by and it had a changing area attachment which is the perfect height. It even had an attachment to put diapers and creams, etc. It was phenomenal. Good luck with everything! I changed mine on the floor-so afraid they would roll off. And wouldn’t you know the one time I changed on older son’s bed my son came in and was so mad at the baby for stealing his bedroom he peed all over the floor!!! You could sit on the sofa? 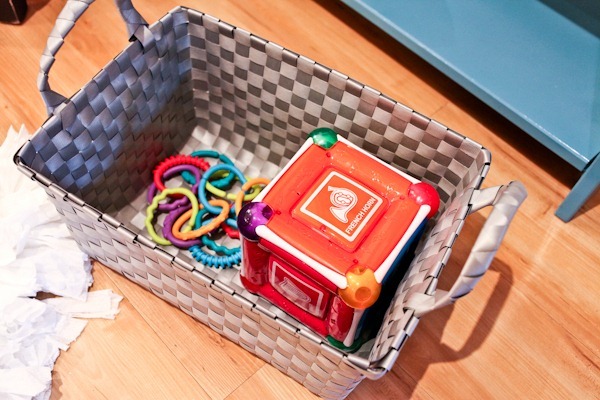 Maybe have a basket filled with everything you would need and just grab it for a quick change. Well look at you. All ready to go! A lovely design! What a lovely space! As far as a rug goes, we have all hard floors and decided rather than a rug to put down those colorful interlocking puzzle-piece style floor squares. We got a set of 30 or so (each 12 inches square) in primary colors and each with a bug letter or number in the middle. They’ve worked so well for us because my girl has always found them interesting and they’re completely poop/puke proof. This was great since our girl was a heavy refluxer up to about 10 months. I also still do diaper changes on it – used my pack and play for a while, but once she got too big for that I moved to the floor and it’s so much easier. Other than immediate clean up of messes, I just wipe the mat down every week when I mop the floors, so keeping it clean is super easy. I’ve also rearranged the squares at varying points in time based on her needs and favorites places of the moment, very convenient. And I’m with you on the chair for nursing. I tried to nurse on the couch for a while and it was so uncomfortable. We finally broke down and bought a chair and it made a world or difference! One other thing I’m finding interesting is where folks stand on having a “separate” spot for the baby/kid stuff. I’ve taken the approach of turning a quadrant of my living/sitting room into the baby/kid zone. That works really well for me because her stuff isn’t everwhere, but she’s also where I can easily keep an eye on her while I put together lunch or something in the kitchen. This started being really handy once she was old enough to play independely for a bit and even when she was littler I kept her pack and play there so I could lay her down for a minute while I grabbed some water, put something in the oven, etc. I’m interested to know what others see as the pros/cons of having the baby/kid have a separate space from the main living space. Another kid zone thing my girl loves now that she’s older is havign her own drawer in the kitchen. While I’m working in there she loves to open her drawer, sort through her things (I try to change up what’s in there) and toss stuff about. Good for both of us! LilBits is 10 months old already (!) and still loves to be soothed on the exercise ball when she is overtired or teething and needs some help falling asleep. I also found the ball was great for a different approach to tummy time – I’d hold her arms or torso and gently roll the ball around with her “flying” on top – she seemed to fuss a wee bit less than on the floor in those early weeks. It looks like such a cozy spot! Especially love the chair. 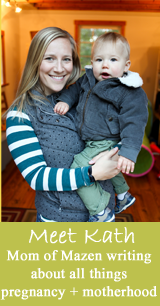 Just wondering if you think it will be hard to take baby from constant naps to the basement for feeding and playtime? I’ve always assumed it would be more convenient to have a living room/den near the baby’s room for playing. Thanks! I think he will probably nap in the basement some – at least in the early months. I really don’t have a choice – it’s just a flight of stairs. The living room is just impractical with all its glass and hard rugs and things. Did I mention I love that chair!! Basements! I havent thought about one of those in a decade++ No basements in CA! I grew up with them in the midwest but not out here! We were lucky enough to have a house with a basement and used it for the play area! The kids were only allowed to bring one toy upstairs to play with at a time. My upstairs was always neat and tidy, including the kids rooms. It was a lifesaver for when people unexpectedly showed up, they did not have to walk into our mess! 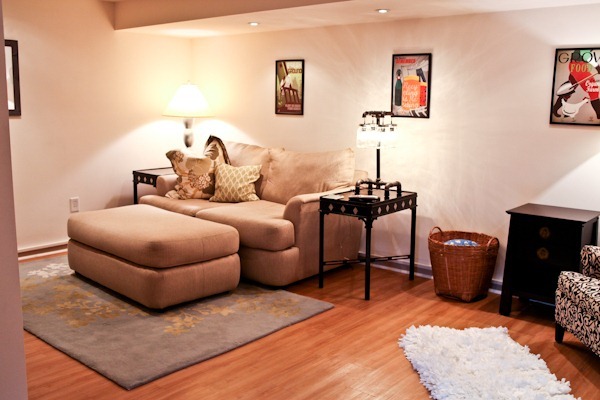 Kath, the basement really looks great! Not that I’m surprised! I can not wait for this little man to be born, I can only imagine how excited you and Matt are getting! My standard for picking out what type of chair/location to nurse on was “can I nap comfortably here?” And lo and behold, our baby wouldn’t sleep anywhere but ON one of us for the first several weeks – and from people I’ve talked to and what I’ve read, that can be pretty standard! I got something like this: http://www.la-z-boy.com/Product/4087-7065/Calvin-Chaise-Recliner/ and I cannot tell you the difference it made – I was nursing an average of 45 minutes out of every two hours, and since the baby would only sleep on one of us, reclining all the way back (after rocking the baby to sleep in the chair) to nap myself was a godsend. I know you said you didn’t want to get a glider, but I would literally give up every other piece of baby equipment for my chair. 🙂 The single best investment I made. I also second whomever recommended not changing your baby on the ottoman – you’ll kill your back like that! 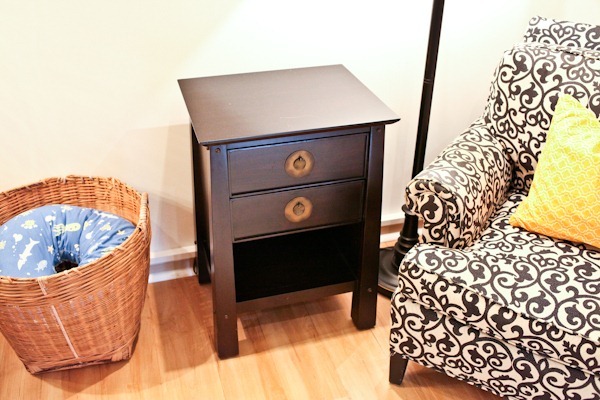 You definitely want to do most of your diaper changes on a table or dresser that’s much higher, especially since you’ll be changing 80 diapers a week the first few weeks. And baby poop can run the gamut of every color under the sun, pretty much! The initial poop is black tar, and every color but white or red is okay. I’m sure you know this already, but if your baby’s poop really is white or beige, call your doctor straight away, it’s a sign of major liver damage! I know this isn’t a priority for a while, but once you have a crawler/climber you will want to make sure your bookshelves are anchored to the wall. 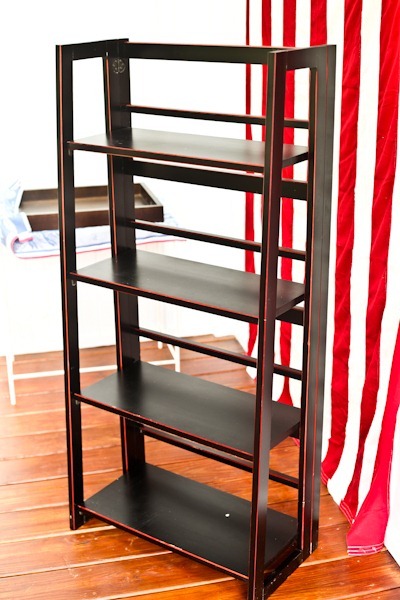 I would say especially so if it’s a fairly lightweight bookshelf filled with colorful items and baskets to explore! I really like how you set it all up. I think the chair in the corner is a perfect spot! Oh, one other thing you may want to think about – do you have a bathroom downstairs? One thing that was really rough for me was that I started out hanging out in the living room, but our only bathroom was upstairs, and the nurses told me when I left the hospital that I shouldn’t go up and down a flight of stairs more than once or twice a day. It was REALLY rough for me, increased my bleeding, etc. to keep trekking up and down the stairs the first few days home, until I relocated everything (including my beloved chair!) upstairs to my bedroom. And I didn’t have a c-section or anything. Something to think about! We do – right around the corner. The kitchen, however, is on the top floor! Looks nice and cozy! Love the color you picked for the shelves. The only thing I wanted to point out is to be careful having the baby on that kind of rug. They loooove putting everything in they’re mouth and it would be pretty easy to choke on one of those long strands! 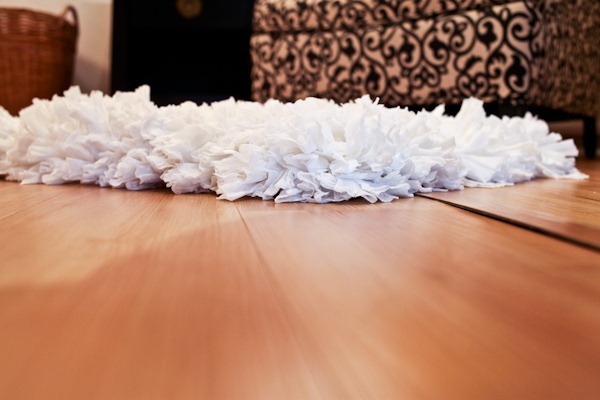 Rug shopping has been such a headache – they are so expensive! I’m going to head to my Pier 1 to see if they have the same one in yellow 🙂 And nice steal of a deal on the baskets! Gotta say that my glider was one of my ‘must have’ items for both babies. My ‘baby’ is three now and sometimes he lets me rock and sing to him….melts my heart! It’s also our go-to place when they are sick and need soothing.I giggled at the notion of ‘rocking’ my babies on an exercise ball….in my zombie like state, we would have all tipped over! Can’t tell you how many times I dozed off nursing in the middle of the night in the glider. You are so dang organized, it will help you so much! Keep LOTS of water bottles close. Seriously the second the baby latches on, you will get the most intense thirst you have ever had. its crazy! I absolutely love the baskets you purchased at World Market! 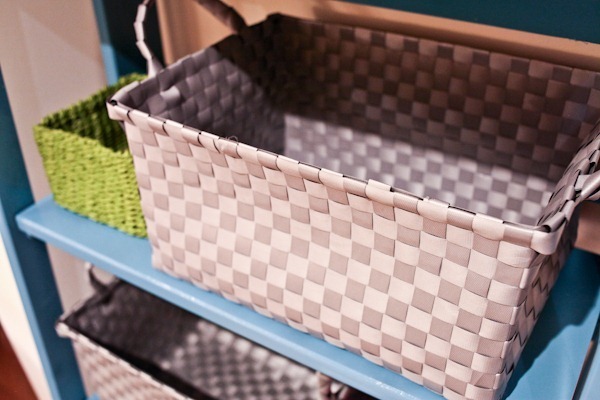 Baskets can be expensive, & I never really looked at baskets at World Market. So, the next time we go there, I will have to buy some. What do you intend to keep in the yellow chest that you moved downstairs? No idea – granola bars? Baby poop is no where near white and will not blend in at all on that rug, just a fair warning. 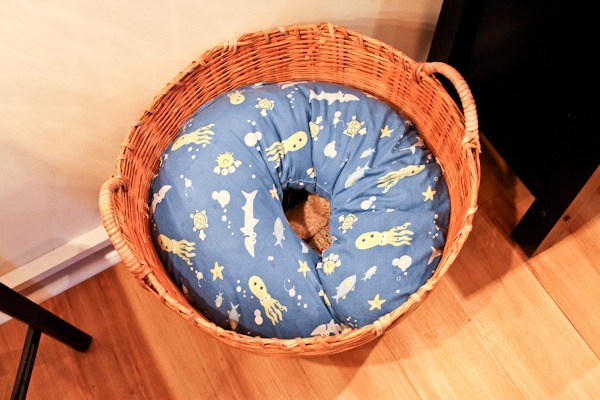 It’s really cute, but if the baby does have a massive blow out on it, be prepared to toss it. I have quite a few white onsies left over from my son that have been washed countless times and the poop stains on them from his blowouts are still visible. That crap (har har) stains. That looks like a pretty big ottoman, could a crib sheet fit on it? 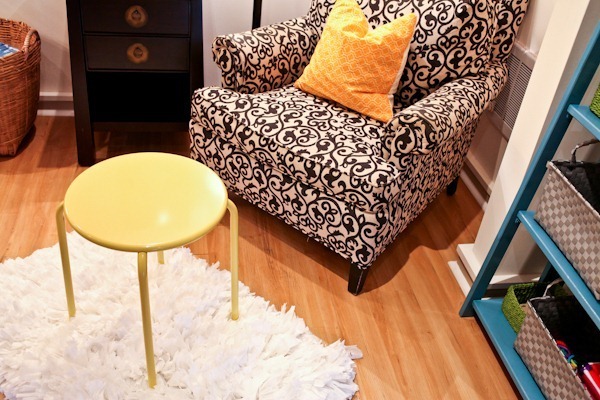 Kath, where did you purchase your yellow foot stool?